Ilston is a small, inland village, in the heart of the Gower peninsula, West Glamorgan. It stands at the head of an attractive wooded valley, Ilston Cwm, through which a stream meanders south. The village is little more than a row of houses along a country lane, and even the neighbouring quarry is disused and has reverted to a nature reserve. 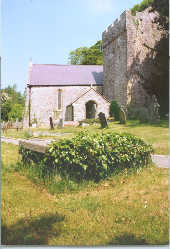 The most impressive and eyecatching feature of the village is its church, dedicated to St Illtyd. Yet for all its remote tranquility, Ilston holds a key place in the ecclesiastical history of Wales and Britain. For it was here, in the village and its valley, that one of the earliest Baptist congregations gathered to worshlip. The Baptist movement mushroomed during the 1640s, taking advantage of the religious freedom of the civil war years and the breakdown in censorship. Baptists split into two groups: General Baptists, who rejected Calvinist ideas of predestination and believed that all might be saved through grace, and Particular Baptists, who held to the Calvinist belief that only the elect were predestined to be saved. Both stressed the need for the complete separation of church and state, believed in rigorous self-discipline, shunned all types of ‘sins’, including gambling and dancing, and laid great weight on the gospels. Baptist congregations were voluntary associations of free and equal members, who organised their churches on a democratic basis, electing their ministers or elders. They held that the baptism of the unthinking, unknowing infant was worthless. Instead, the baptism of the adult believer sealed the covenant of grace and marked his or her entry into the church. The Baptist movement grew rapidly from the mid 1640s onwards and by the Restoration there were around 250 Baptist churched in England and Wales, with a total of perhaps 25,000 Baptists. There had been Baptists in Wales and the Marches before the foundation of the Ilston church. As early as 1633, for example, there had been a Baptist community at Olchon, on the borders of Herefordshire and Monmouthshire, and there were Baptists in Radnorshire in the mid 1640s. But there is no evidence that a properly organised, distinct and visible church of Baptist believers existed in Wales before 1 October 1649. 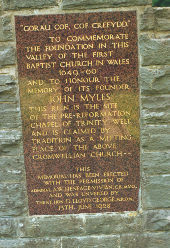 It was on that date that John Miles established his Baptist church at Ilston. John Miles or Myles is a shadowy figure. He was born in 1621 in a Welsh speaking part of Herefordshire. In 1636 he matriculated at Brasenose College, Oxford. What brought him to South Wales and the Gower by the late 1640s is unknown. He may have served in the parliamentary army sent to restore order in the area in 1648. In spring 1649 he and a colleague, Thomas Proud, travelled to London and attended the Glass House, the leading Baptist church in the capital. Duly inspired, Miles returned to South Wales determined to spread the word. Miles founded his first Baptist congregation at Ilston, where he served from 1649 as rector of the parish church in place of an ejected royalist, William Houghton. We know a great deal about the Baptist congregation through the chance survival of the ‘Ilston Churchbook’, now preserved in America. Miles was rather disappointed that his first two converts at Ilston were women, though consoled himself by believing that the Lord was ‘thereby teaching us not to despise the day of small things’! By October 1650 the Ilston Baptists numbered 43 and by the end of that year Miles had baptised his fiftieth member. The last baptism recorded in the Churchbook occurred in August 1660, a few months after the return of Charles II. By then, the Ilston Baptist church had a little over 250 members. The Ilston congregation adapted to take account of the scattered nature of its members – they were drawn from villages and hamlets all over the Gower, with some living further afield, to the east of Swansea or north of the Loughor estuary. In an area where roads and transport were poor, this inevitably created difficulties. As a result, Miles agreed that the whole Baptist congregation should gather at Ilston on only certain Sundays each month. On the other Sundays, and also on set weekdays, the congregation would divide and meet as a number of more local ‘house-groups’, in the houses of its leading members. They became sub-districts of the Ilston church. But all serious matters, such as the baptism and admission of new members, advice to existing members who were planning to marry, and questions of discipline – during the 1650s a handful of members were expelled for drunkenness and sexual misconduct – were to be referred to the full Ilston meetings. There, too, training sessions on preaching took place and approval was given to new preachers. Although Miles had acted as leader from its foundation, not until November 1651 did the Ilston Baptists formally appoint their own officers. Miles was elected pastor, assisted by an elder. Deacons were elected for each of the sub-disticts. Miles was determined to spread the word throughout South Wales. In the early 1650s, and under his influence, further Baptist churches were founded elsewhere – at Hay on Wye and Llanharan/Llantrisant in 1650, at Carmarthen in 1651 and at Abergavenny in 1652. Sadly, the records of these churches are much poorer than those of the Ilston church. The five churches maintained close and regular contact and representatives from each met periodically to discuss points of difficulty or dispute and to maintain overall discipline. Between 1650 and 1656 at least seven such ‘General Meetings’ are known to have been held, the first at Ilston on 6 and 7 November 1650. Miles’s star was in the ascendant during the 1650s. As well as his work with the Baptist churches, he was minister of Ilston parish, appointed an ‘Approver’ under the Act for the Propagation of the Gospel Wales of February 1650 and named a ‘Trier’ under the Protector’s Church Ordinance of August 1654. But with the Restoration, his fortunes rapidly waned. Miles was promptly ejected from the living of Ilston and the former minister, Willlam Houghton, restored. For a time, he probably struggled on in the Ilston area, but by 1663 he and several of his Baptist colleagues had emigrated to Rehoboth, Massachusetts, where founded the first Baptist church in that state. Expelled from Rehoboth in 1667, he moved on and founded a new town, which he named Swansey. He served as its first minister and schoolmaster and, although Indian attacks forced him to seek refuge in Boston in 1675-8, he spent his last years teaching and preaching in his new town. He died at Swansey, now Barrington, Rhode Island, on 3 February 1684. His grave is unmarked and unknown, but in 1905 a commemorative stone and monument in his honour were unveiled in Barrington. Back in Ilston, the remaining members of his Baptist congregation were scattered, or forced underground, by the Conventicle Act of 1664. Not until 1689 did the Baptists and other Protestant nonconformists win grudging religious toleration. In time, Wales in general and Swansea in particular became strongholds of revived Baptism, but Ilston never recovered its former prominence and sank back into obscurity. From 1649 until 1660 the Ilston Baptists met in the parish church St Illtyd, of which Miles was rector or minister, though they always referred to the place as their ‘Meeting House’, not their ‘church’ or ‘chapel’. Baptist services and meetings were open only to members. Indeed, Miles was insistent that non-baptised sympathisers should not be allowed to attend. But Miles would also have held more general services for all the parishioners of Ilston, the majority of whom remained non-Baptists. The church had been built by the local de Breos family in the thirteenth century, probably on the site of an earlier Christian cell. It was drastically ‘restored’ inside and out in the mid nineteenth century, and many of the features familiar to Miles and his Baptists have been destroyed or altered beyond recognition. It is a fairly plain building, with a chancel, a nave with a south chapel, a massive, squat tower with a saddleback roof on the south side of the nave and a south porch. Memorial tablets from the chancel, some dating from the late seventeenth century, have been relaid in the vestry. Over half a mile south-west of the church, deep in Ilston Cwm and near the bank of the stream (map reference SS 563894), is another religious site. The date and history of the remains are not entirely clear and no thorough archaeological or architectural survey has ever been published. However, the present ruins are probably the western portion of a small, rectangular chapel, known as Trinity Well chapel, dating from the late Middle Ages and built, like many similar Catholic chapels, to honour the well and water supply. According to a strong tradltion, but one which receives no clear confirmation in surviving contemporary documents, at some stage – perhaps between 1660, when Miles lost his living and therefore the use of the parish church, and 1663-4, when the congregation broke up or was suppressed – Miles and his colleagues used either this pre-Reformation chapel or a small, crude building erected next to it as a Baptist meeting house. If so the site, although used by the Baptists only briefly, would have considerable historical significance. David Lloyd George was guest of honour and he unveiled the memorial and delivered an oration. In the late 1930s at least two ‘Grand Pageants’ were held in the Ilston valley to commemorate Miles’s Baptist church. They took the form of costume re-enactments of historical scenes, factual or imaginary, interspersed with music and singing. Local clerics and civic dignitaries took the leading parts, including those of Miles, Proud, Houghton, Philip Jones (governor of Swansea) and Oliver Cromwell. The latter appears in Scene IV, stopping at Swansea en route to take ship to Ireland and supposedly deciding to visit Miles at Ilston. There he was welcomed by Miles and was presented with gifts from ‘Morriston maidens’ before replying in a speech in which he played on his own Welsh ancestry, stressed the need for religious liberty and praised Miles and his church. In reality, Cromwell’s brief stay in Swansea while en route to Milford Haven and Ireland occurred at the end of July 1649, two months before Miles established his Ilston church. There is no evidence that Cromwell ever met Miles, let alone traipsed out to Ilston. In recent years the site has sunk back into obscurity and is rather overgrow in summer. It can, however, be visited quite easily, for it lies close to the public footpath which runs along the bottom of Ilston Cwm. It is roughly a quarter of a mile from the southern end of the footpath, which joins the main A4118 half a mile or so east of Parkmill. A longer but far more attractive walk is to approach the ruins from the northern, Ilston end of the cwm – the footpath begins by St Illtyd’s church.